I can't find any information on how to disable Windows Defender in Windows 10. There is some information about how to do it in the previews, but the configuration pages have changed with the final release. Specifically, I want to stop and disable the Windows Defender Service. Using net stop windefend from an elevated command prompt gives "access denied"
Has anyone figured out how to disable Defender in Windows 10? You are able to do this using a Group Policy. I found another way using the registry. Browse the registry to HKEY_LOCAL_MACHINE\SYSTEM\CurrentControlSet\Services. 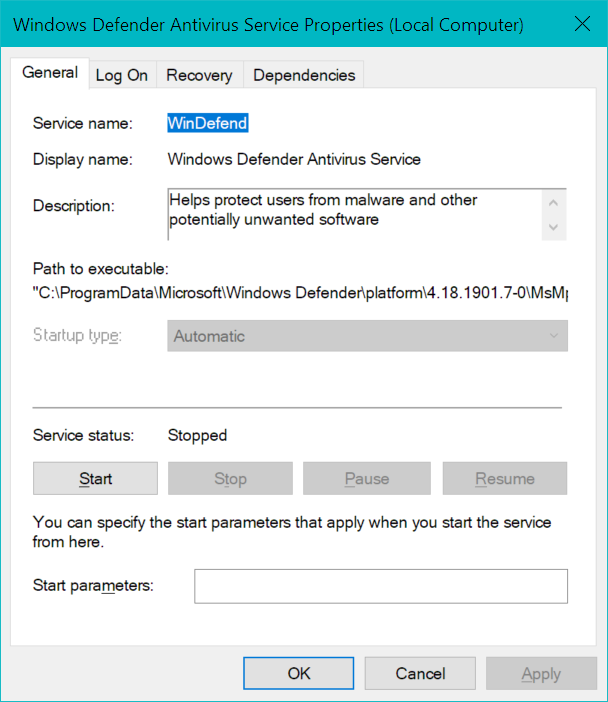 Look for services starting with "wd" that have "Windows Defender" in the Description value. A possibly incomplete list is: wdboot, wdfilter, wdnisdrv, wdnissvc, windefend. Change the Start value for each service to 0x4 (hex 4, decimal 4). 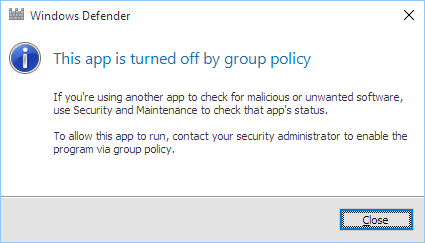 By far the most effective and clean way to permanently disable Windows Defender in Windows 10 is via Group Policy, as described by Aaron Hoffman. Unfortunately, Windows 10 Home lacks the necessary tools. Here's a registry file that contains the changes made by gpedit.msc on a Windows 10 Pro machine. It's been tested on Windows 10 Home as well. Save the file as DisableDefender.reg with Windows-style line endings and double-click it to import it into your registry. If you ever want to re-enable Defender, change 00000001 to 00000000 on both lines. You can download the files to disable and re-enable defender from Gist. Install another security suite (as Ramhound mentioned). I have written the batch file and registry files that should completely disable Windows Defender in Windows 10. Save the following files into the same folder. Run Disable Windows Defender.bat as administrator. After the batch file is done, restart. Run Disable Windows Defender.bat again as administrator. Windows Defender should be completely disabled now. rem Check if Windows Defender is running. rem Windows Defender is running. echo Windows Defender is running. rem Performable operations while Windows Defender is running. rem Disable Windows Defender drivers. rem Disable Windows Defender objects. call :importRegistry "Disable Windows Defender objects.reg"
rem Require restart to unload Windows Defender drivers and objects. rem Windows Defender is not running. echo Windows Defender is not running. rem Performable operations while Windows Defender is not running. rem Disable Windows Defender features. call :importRegistry "Disable Windows Defender features.reg"
rem Disable Windows Defender services. call :importRegistry "Disable Windows Defender services.reg"
rem Disable Windows Defender files. ren "%ProgramFiles%\Windows Defender" "Windows Defender.bak"
ren "%ProgramFiles(x86)%\Windows Defender" "Windows Defender.bak"
ren "%ProgramData%\Microsoft\Windows Defender" "Windows Defender.bak"
; Disable "Scan with Windows Defender..." right click context menu. ; Disable Windows Defender IOfficeAntiVirus implementation ("MpOav.dll"). ; Disable InfectionState WMI Provider ("MpProvider.dll"). ; Disable Status WMI Provider ("MpProvider.dll"). ; Disable Microsoft Windows Defender ("MsMpCom.dll"). ; Disable Windows Defender WMI Provider ("ProtectionManagement.dll"). ; Disable AMMonitoring WMI Provider ("AMMonitoringProvider.dll"). ; Disable MP UX Host ("MpUxSrv.exe"). ; Disable Windows Defender features. ; Disable "Windows Defender" services. rem Get the location of the PowerShell file. rem Run command for each argument. powershell -executionPolicy bypass -file "%%~f" "%%~a"
# The process on which to adjust the privilege. Defaults to the current process. # Switch to disable the privilege, rather than enable it. # Taken from P/Invoke.NET with minor adjustments. write-host "    Unable to open children subkeys." write-host "    Unable to open subkey." write-host "    Key does not exist." # Own parent key and children subkeys. $privilegeResult = enablePrivilege -privilege "SeTakeOwnershipPrivilege"
write-host "Unable to receive privilege." The easy powershell method is here from an answer I posted on a question later marked duplicate for this. It would be helpful to understand why you cannot stop a particular service. I'm the administrator; worse than failure can't the Administrator administrate?! It's because of the security permissions on the WinDefend service. Note: WinDefend is the actual name of the "Windows Defender Antivirus Service"
sdshow means "Displays a service's security descriptor." Each ACE is a set of 5 semicolon terminated settings, followed by who it applies to. Each ACE contains a list of permissions that the user is being allowed or denied. And this is where i'm going to have to stop to save my work. This detour into how to stop the Windows Defender service is interesting and all: but i've already stopped it, and my PC is still misbehaving. Find, download, install "SysInternals" program suite. After doing that, my startup time decreased from 20min to 5min, and memory usage after startup (before launching any apps) decreased from 2.1GB to 1.2GB. And when I looked in "Services", I found that "Windows Defender Service", while still there, is now marked "NOT running, Disabled". Then reboot. I have not been able to find away to shutdown the service once it is started with out a reboot. It is not so easy to reliably and totally disable the Windows Defender. There is a PowerShell script that uninstalls Windows Defender, but you may not be able later to install it back. This script requires two reboots. Run scripts\disable-windows-defender.ps1 one more time. This is not the easiest way, but very reliable and resilient. There are also the scripts to remove unnecessary programs like BingFinance, Skype, OneDrive, etc - if you don't need them. The archive does also contain lot of scripts that you may find useful. Please be aware that these scripts irreversible delete files and can delete vital functions of Windows. For example, they may totally disable the Start menu! Don't run disable-ShellExperienceHost.bat from this package, otherwise the Start Menu will stop opening. I managed to disable it using Autoruns; under the services tab there is an entry WinDefend, untick the box and reboot. How can I disable Windows Defender using the command line? Is it possible to disable Windows Defender in Windows 10 [Home] per user? How to stop an unstoppable windows 7 service? Restart Windows Defender on Windows 10 Home? Why does Windows 10 Compatibility mode pop up a UAC prompt?